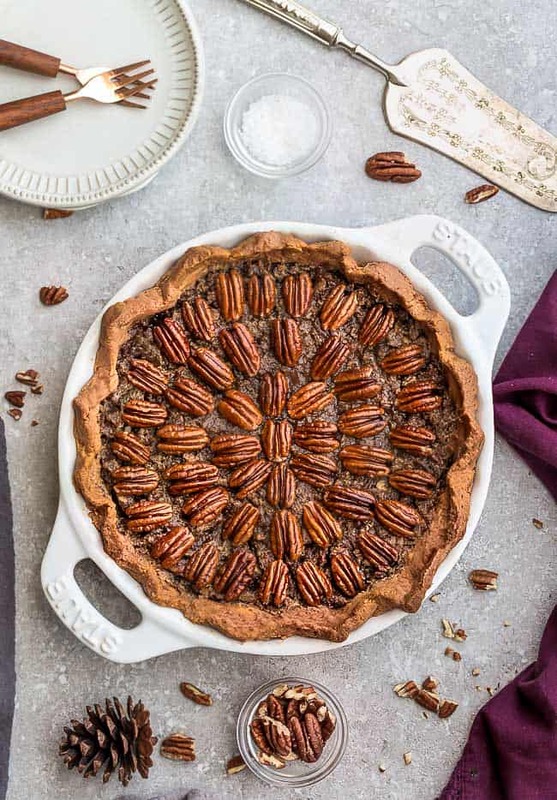 Keto Pecan Pie – the perfect sugar free low carb dessert for Thanksgiving. Best of all, this healthier pecan pie has all the texture and flavors of the delicious classic pie. Gluten free, paleo & easy to make. No holiday dessert table would be complete without a slice of pecan pie. Just as popular as pumpkin pie (if not more depending on who you ask), it’s another classic favorite! 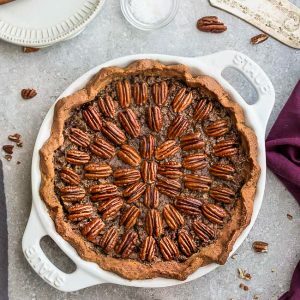 WHAT INGREDIENTS DO I NEED TO MAKE KETO PECAN PIE? 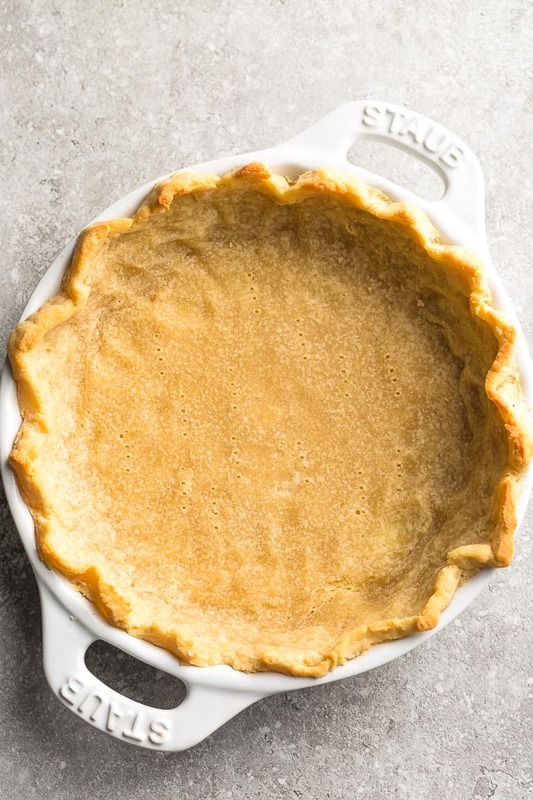 The gluten free pie crust is the same one as the Keto Pumpkin Pie and is made with a blend of blanched almond flour and coconut flour, which I find create a nice and light texture. 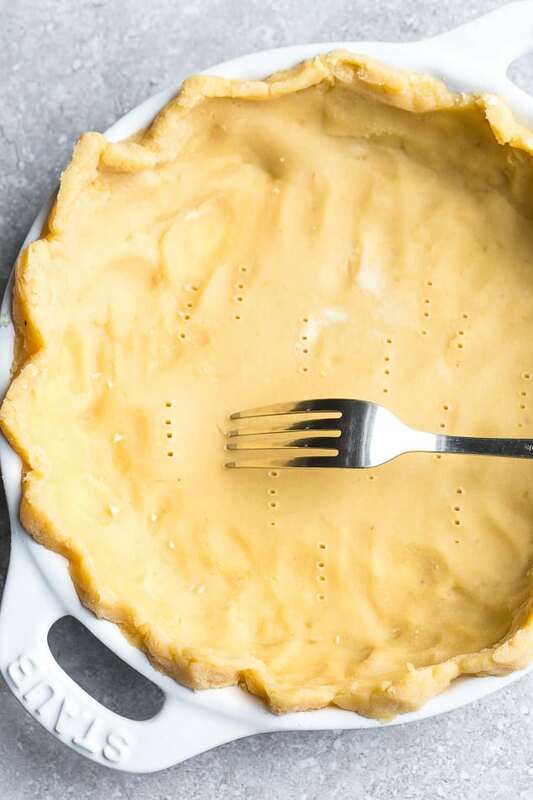 Once your pie dough is ready to go, drape it over a 9″ pie plate, flute the crust and pierce the crust using a fork. Next, you’re going to place the pie pan in the freezer for about 15 minutes. Once the crust has had a chance to chill out, you’re going to blind bake the crust for 15 minutes at 325 F before adding the gooey pecan pie filling. a touch of almond butter. 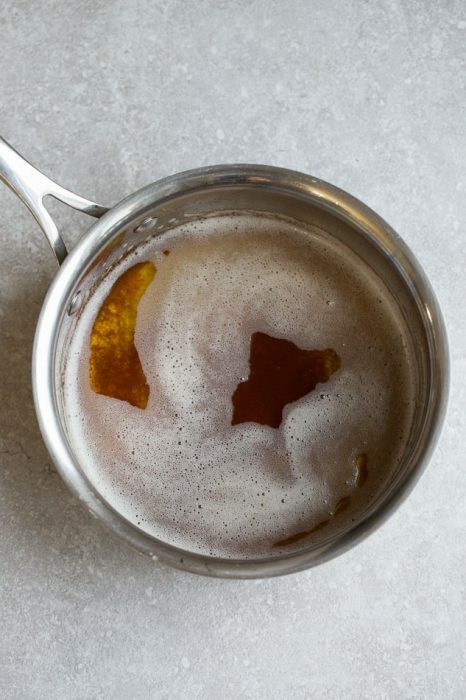 Brown butter is one of those magical secret ingredients that can enhance the flavor of just about anything. It has a rich nutty taste and the aroma is out of this world. Plus, it’s really easy to make. 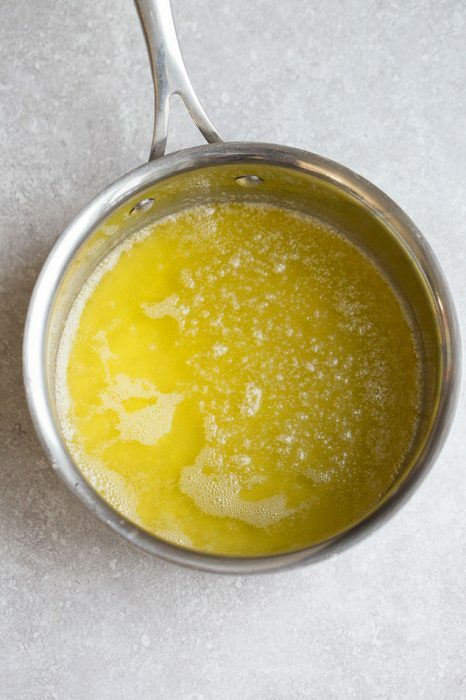 Start by melting butter in a heavy duty pot over medium heat. Swirl the pot occasionally to prevent burning. The butter will begin to foam and the color will go from lemony-yellow to golden-tan to, finally, a toasty-brown. Once you smell that nutty aroma, take the pan off the heat and transfer the browned butter into a heat-proof bowl to cool. Once you’ve browned the butter and allowed it to cool down. We’re going to add the rest of the low carb pecan pie filling ingredients. You want to make sure the caramel filling is cool enough to not scramble the egg but not completely cool that it will start to solidify. You’ll whisk in the golden monk fruit sweetener, followed by the full fat canned coconut milk, almond butter, vanilla extract and sea salt. When the sauce is cool enough, beat in the eggs until smooth then stir in the chopped pecans. Transfer the filling to the par-baked crust. Top with pecans in desired pattern then bake in preheated oven at 325 F for 40-50 minutes or until the filling has set. You can cover the crust with aluminum foil to prevent the crust from browning too much. This dairy free pecan pie filling bakes up nice, gooey and rich with a balanced sweetness. 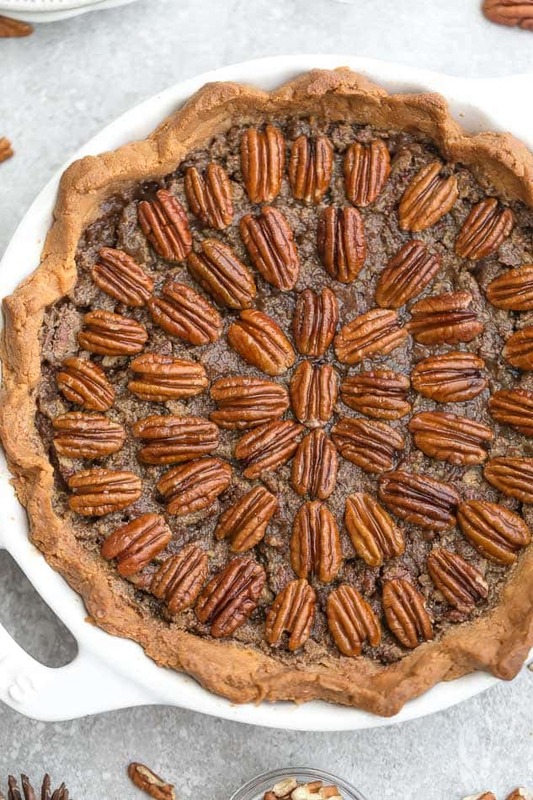 This sugar free pecan pie makes the perfect dessert to celebrate the festive season. 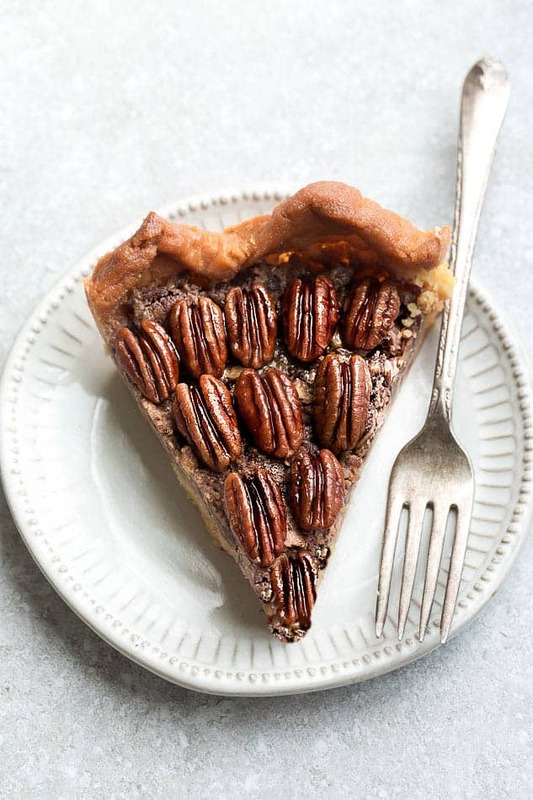 With all the holiday parties happening now, it’s nice to have a gluten free and dairy free pecan pie for those family and friends with special dietary concerns. 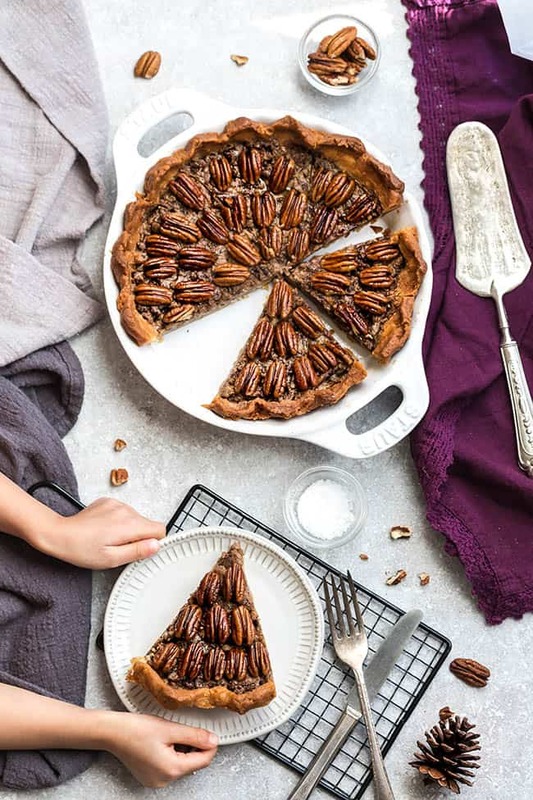 Keto Pecan Pie makes a healthier treat that tastes decadently rich but not ridiculously sweet and is diabetic friendly as well. 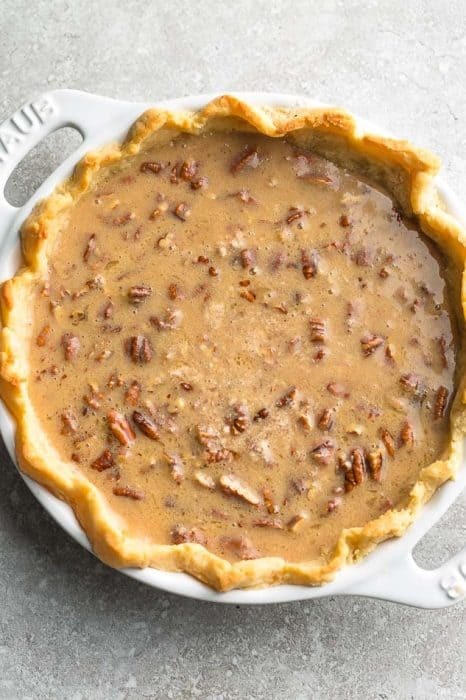 CAN YOU MAKE KETO PECAN PIE AHEAD OF TIME? Yes, low carb pecan pie is the perfect make ahead dessert. 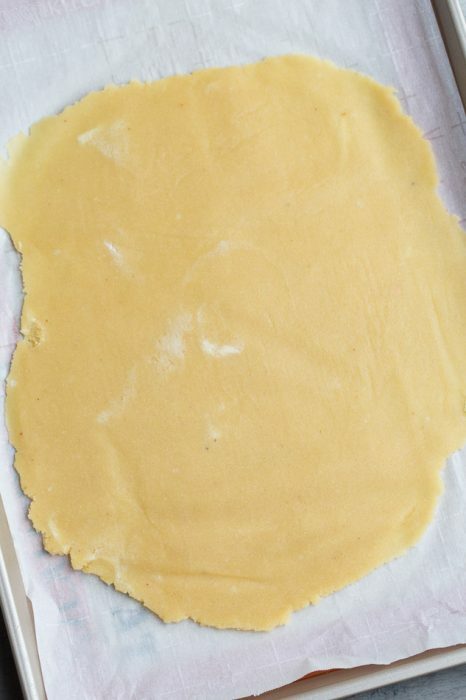 You can make the crust in advance and freeze it for when you’re ready to bake. You can also make the filling a day or two ahead and store it in the refrigerator in an airtight container. Once you’re ready to assemble, you can reheat the filling over low heat and then pour it into the pre-baked keto pie crust. 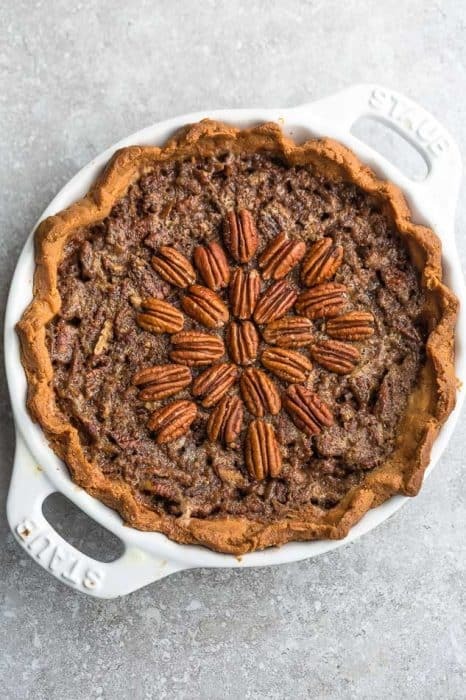 CAN YOU FREEZE LOW CARB PECAN PIE? Yes, I always make my sugar free pecan pies ahead of time and freeze them. Simply wrap with foil or plastic wrap and store it in the freezer for up to 2 months. When you’re ready to reheat, remove from freezer and thaw in the fridge overnight. 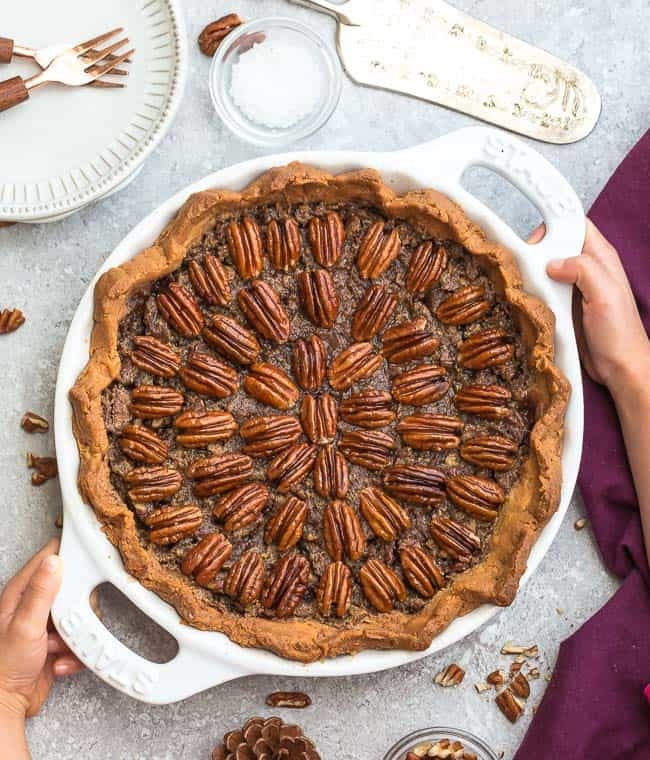 Keto Pecan Pie - the perfect sugar free low carb dessert for Thanksgiving. Best of all, this healthier pecan pie has all the texture and flavors of the delicious classic pie. Gluten free, paleo & easy to make. Combine the almond flour, coconut flour, powdered monk fruit, salt, butter and coconut oil in a food processor and pulse / process until large pea sized crumbs appear. Add the egg, then pulse again, until dough forms and comes together. 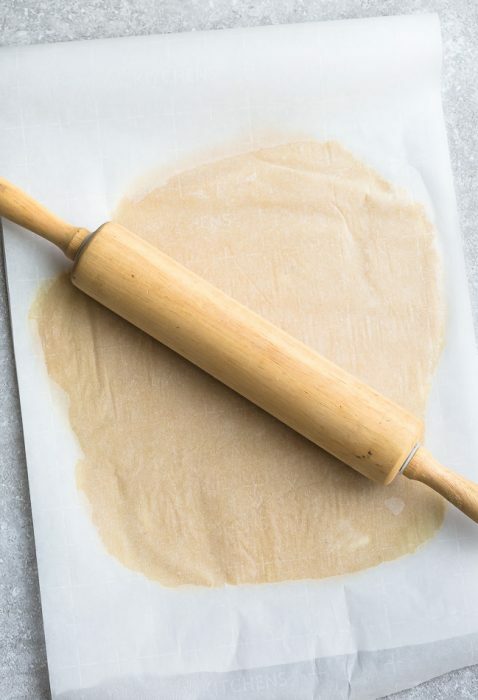 Add more almond flour (1-2 tablespoons at a time) as needed, if dough seems too wet. Preheat the oven to 325°F. Remove the pie pan from the refrigerator and par-bake the crust for 15 minutes or until very light golden brown around the edges. Remove from oven and set aside to cool. 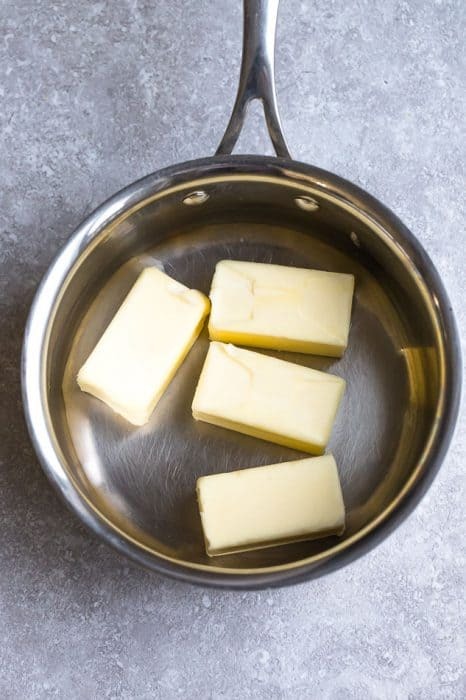 Heat butter in a large heavy bottomed saucepan over medium heat, whisking constantly. 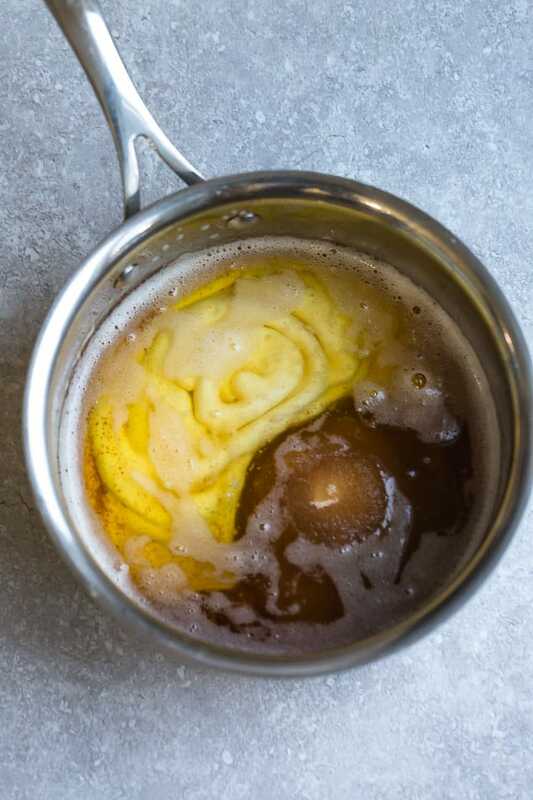 Once the butter starts boiling, continue whisking until you see brown bits starting to form at the bottom of pan as you are whisking. Remove the pan immediately from the heat and turn heat off. Whisk in the golden monk fruit sweetener until combined. Add almond butter, coconut milk, sea salt and vanilla and whisk until smooth. Allow the sauce to cool slightly. 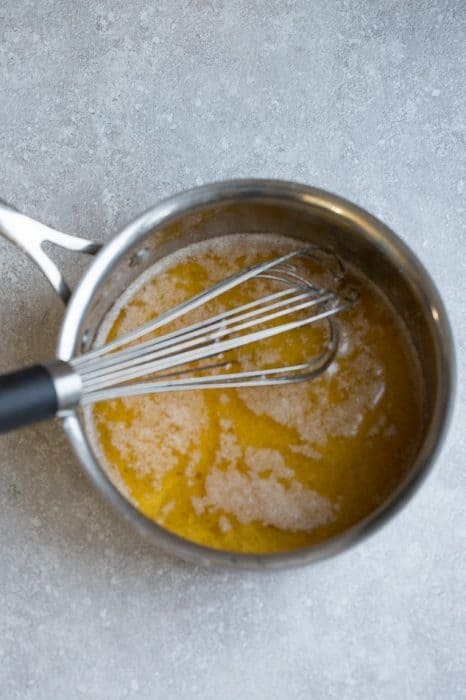 Once cool, slowly whisk in the eggs until combined. Stir in the chopped pecans and pour into the par-baked crust. 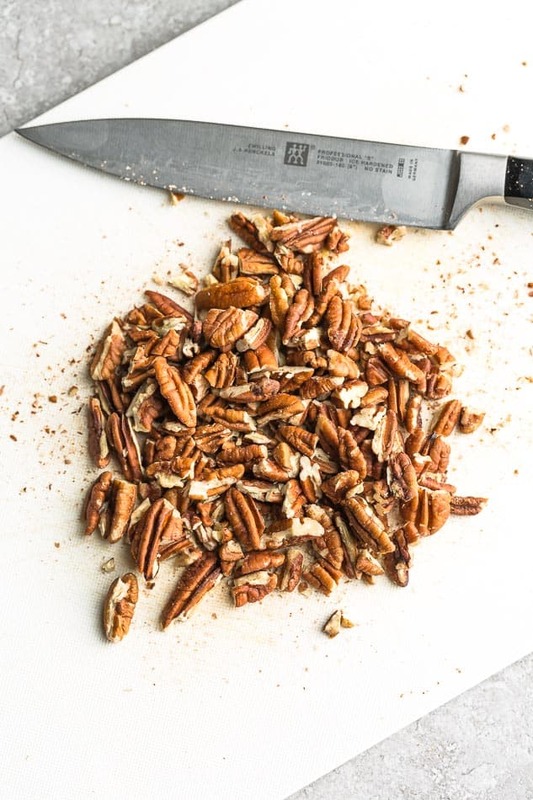 Arrange pecan halves on top to design of your liking. Cover the crust edges with a pie shield or aluminum foil to prevent burning. Bake for 40-45 minutes or until center is nearly set (still a bit jiggly) and crust is deep golden brown. Allow to cool completely at room temperature for at least 1 hour before slicing. If making ahead, wrap and store in the refrigerator for up to 2 days.